Many of Maine’s policymakers have already fallen for the siren call of Medicaid expansion as provided for under the provisions of the Affordable Care Act (Obamacare). At first glance, expanding Maine’s Medicaid program looks like free money since Uncle Sam has promised to pick up the entire tab for the first three years. Who doesn’t like free money? In reality, nothing is free. Maine has already been growing increasingly dependent on Medicaid and paying a steep economic price as public sector spending crowds out the private sector (see Methodology section for details). As shown in Chart 1, Maine’s private sector has significantly declined by 28.8 percent to only 65.8 percent in 2012 from 92.4 percent in 1929. Consequently, Maine now has the 11th smallest private sector in the county (see Table 1). 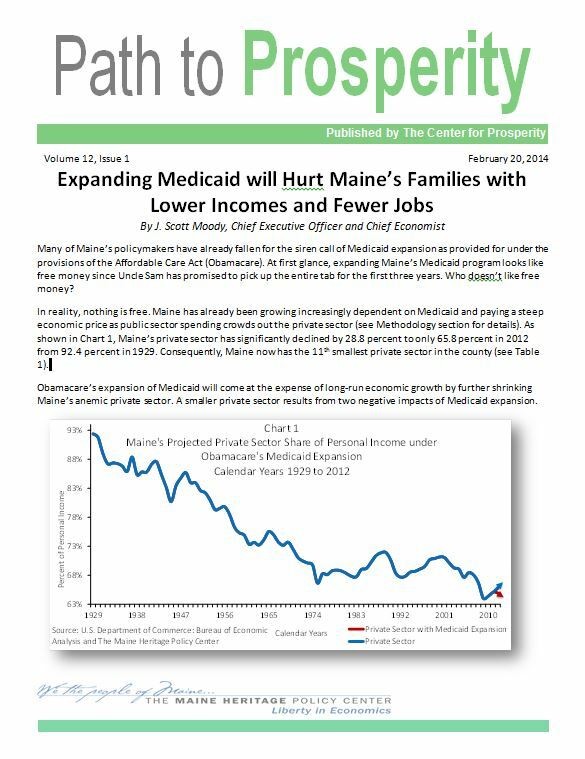 Obamacare’s expansion of Medicaid will come at the expense of long-run economic growth by further shrinking Maine’s anemic private sector. A smaller private sector results from two negative impacts of Medicaid expansion. First, it will have to be paid for by higher taxes or borrowing (albeit at the federal level for the time being), leaving less money in the pockets of individuals and businesses and reducing their ability to invest for the future. Second, it will crowd-out the private sector in competition for scarce labor and capital. According to estimates from the Alexander report, the expansion of Medicaid will boost spending by $575 million in its first year. [i] If this occurred in 2012, that additional public spending would have reduced the private sector by up to 0.83 percentage points. 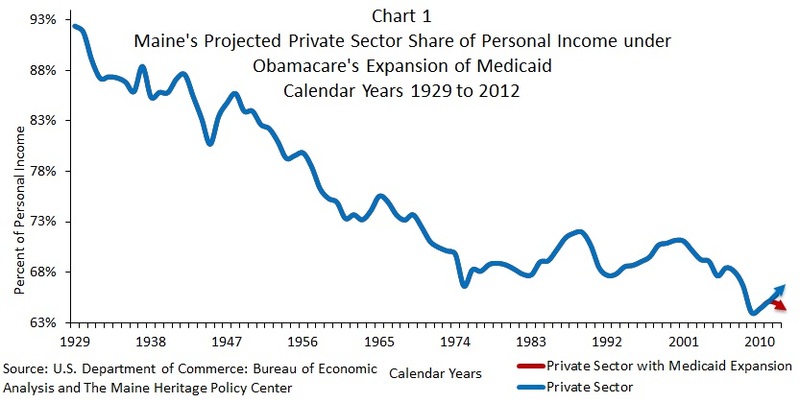 More troubling, as shown in Chart 1, Medicaid expansion would reverse the growth in the private sector following the “Great Recession” and force it on a downward trajectory. Maine’s policymakers should be very concerned about this “crowding out” of the private sector by government spending because Chart 2 reveals a significant correlation between the size of a the private sector and household income. As a consequence of Obamacare’s expansion of Medicaid, Maine’s taxpayers will pay a steep economic price with lower incomes and fewer jobs. No change in personal income but the loss of 30,988 private sector jobs. 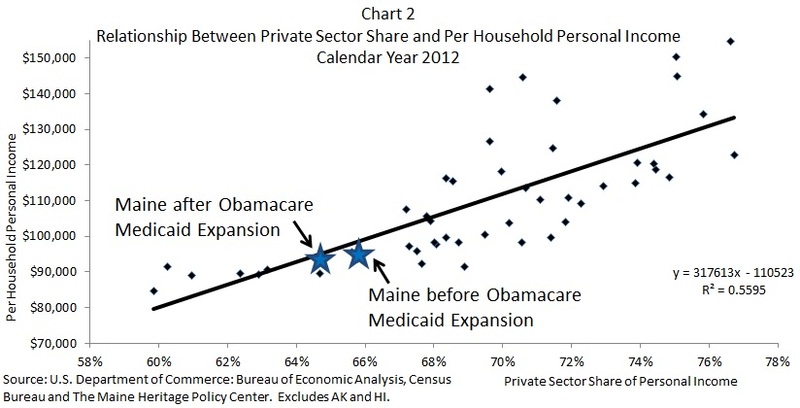 Table 1 and Chart 2 show how Maine’s private sector would lose ground relative to the other states. 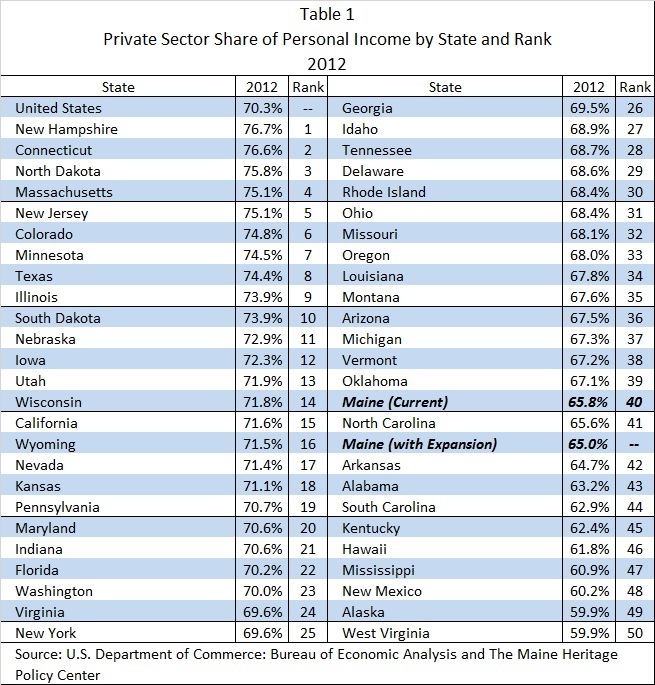 Maine’s ranking would fall from the 11th smallest private sector in the country to the 9th smallest. Only 5.1 percentage points separates Maine from lowly West Virginia (59.9 percent) while 11.7 percentage points separate Maine from number 1 ranked, and next-door neighbor, New Hampshire (76.7 percent). 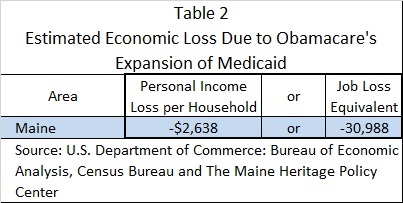 In conclusion, Obamacare’s expansion of Medicaid is not “free” as there will be economically devastating repercussions to the long-term health of Maine’s economy. Clearly, the better option is to shelve Medicaid expansion and reduce government spending, which in turn would expand the private sector. The private sector could then get back to work increasing incomes and creating new jobs. Personal income comes from two sources: the private sector and the public sector. The distinction between the two sectors is important because only the private sector creates new income. The public sector, in contrast, can only redistribute income through taxes and spending. More specifically, public sector spending consists of personal current transfer receipts (Medicare, Medicaid, Social Security, etc.) and government employee compensation (federal, state and local). The economic loss estimates in this study are derived from the significant positive correlation between per household personal income with the private sector share of personal income for 2012 as shown in Chart 2. Put simply, the bigger the private sector then the greater per household personal income. When examining the 48 contiguous states, the analysis finds that, on average, a one percentage point decrease in the size of the private sector yields a decrease in per household income of approximately $3,176. Obamacare’s expansion of Maine’s Medicaid system by $575 million would significantly change the composition of Maine’s personal income toward public sector spending and shrink the private sector by up to 0.83 percentage points. That means, in the next few years, the average household in Maine would see their income drop by up to $2,638 or the number of jobs reduced by 30,988. The overall loss in personal income would be up to $1.491 billion ($2,638 multiplied by 565,063 households). This analysis estimates a reduction in the long-term growth in the economy and does not necessarily mean the elimination of existing household income or jobs. It does mean that future income increases and job creation will be lower than they would be in the absence of higher taxes and spending. Furthermore, this analysis underestimates the long-term decline in the private sector that will occur because of a slower private sector growth rate.